Now that you have seen what Lightroom has to offer, you can start the setup process. If you follow the steps in this lesson, you can get started with Lightroom quickly. Where do the image files live? Where does the catalogue live? What if I already have Lightroom catalogues? The way you setup Lightroom will depend on the class of computer system you are using. This can range from a single laptop computer with a pair of external hard drives up to a system that uses multiple computers and lots of external storage enclosures. We will cover 3 basic setups. There are other ways to set up your Lightroom catalogues and your photo collection, but they are generally some kind of variation on these setups. When you start an image library with Lightroom, you will want to make a place for your images. This needs to be an orderly structure, with a simple folder arrangement that can grow with you. (It is very important that you do not move your pictures around after they get put into folders, or Lightroom will lose track of them. It can be time-consuming to reconnect images to the catalogue once this happens). In most cases, you will probably want to have your main Photo Archive on an external hard drive, or a dedicated drive inside a tower computer. Image files take up a lot of space, and most active photographers will not be able to store their entire image collections on the internal drive in a laptop or on the main boot drive of a desktop. Figure 1 shows a common structure for your photo collection. Can I store my photos on DVD? DVD is good to use a backup storage media, in addition to one hard drive backup. But it is not good as a primary storage media. DVD is very slow to read and write from, so the pictures are much less accessible. We strongly suggest that you keep a hard drive copy of your photo collection, so you will have added security and access to the photos. You will need to decide where your catalogue (or catalogues) will be saved. You will want the catalogue to be easy to get to, since you will be using it when you want to find pictures, work on your pictures, output pictures, etc. In a tower computer, the choice is pretty simple; the catalogue should be saved to an internal hard drive with plenty of available space. I suggest saving it to a 'Working' folder in the root directory of the hard drive, rather than the default location which is in the pictures folder of the User directory. This arrangement is outlined in Option 1 below. If you use a laptop computer, the choice may not be so simple. Ideally, the catalogue would live on the internal hard drive of your laptop, so you have easy access to it at any point in time. Your internal drive is also often the fastest storage device, which helps Lightroom workflow. Sometimes, however, your catalogue w ill not fit on the internal drive, due to space limitations. In this case you have 2 options. You can keep the entire catalogue on an external drive. This lets the catalog be a unified place to manage your entire image collection, which has some important advantages. But it has disadvantages as well. You will only be able to use Lightroom when the external drive is attached to the computer. This reduces the convenience of the programme. And it also adds an element of risk, since accidentally disconnecting the drive can corrupt a Lightroom catalogue that is in use. This arrangement is outlined in Option 2 below. You can also split things up this way. A master catalogue can live on the external hard drive, and a smaller catalogue of current works-in-progress can live on the internal drive of the laptop. This way you have easy and immediate access to your current projects from the laptop's internal drive. And you can have access to the whole collection back in your office or studio through the master catalogue. Once your projects have been delivered, or you need additional space on the laptop's internal drive, you can remove the files from the Project Catalogue and add them to the Master Catalogue. This arrangement is outlined in Options 2 and 3 below. This system is made up of a single computer - either a laptop or desktop - and a pair of external hard drives. Figure 2 outlines the process. This system is very much like the one described above, but in this case the Lightroom Master Catalogue does not fit on the computer's internal hard drive, and must be stored on the external drive. When you are working at your desk (or anywhere else that you can have the external drive attached to the computer) this system functions almost exactly like Option 1. However, if you are working on location, you may want to make use of a Project Catalogue or a Works -in-progress catalogue for your current work. Figure 2 can help you understand this arrangement. Many photographers eventually get multiple computers to do their work. A Desktop computer may live in the studio or office, and do most of the image processing work. A laptop may be used on location to download and prep images. If this describes the way you work, you will want to watch the movie in Figure 3 to get some tips on how to set up this system. Create a Working folder and a Lightroom folder inside it to hold the catalogue. Open Lightroom. On Windows, hold down the Control key, and on MAc, hold down the Option. 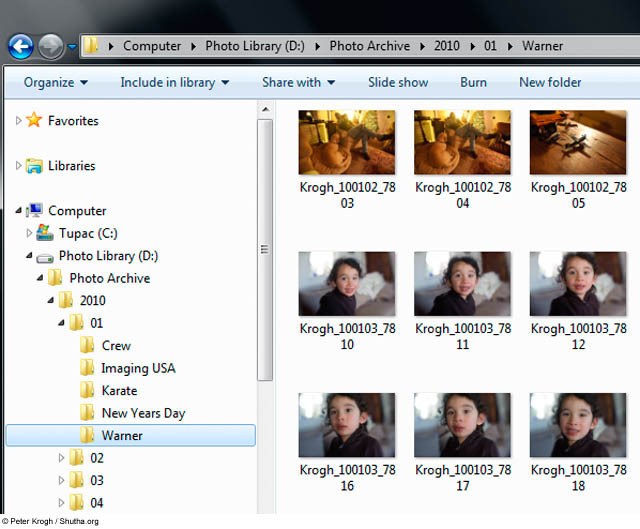 FIGURE 5 This movie shows you how to create a Master Catalogue in the Lightroom subfolder of the Working folder.. If you have already played around with Lightroom a bit, and have several catalogs, you will want to collect them into one large master catalogue. Fortunately, Lightroom makes this process pretty easy. You have three basic choices. If you have one main catalogue, it's probably best to make this your Master Catalogue. Rename it (if necessary) and move it to the Working folder (if necessary). This is outlined in the movie in Figure 6. If you have lots of little catalogues, and none is likely to be more comprehensive than the others, you can make a new Master Catalogue as outlined above and import the other catalogues into it. This is outlined in the movie in Figure 7. Make sure that you mark the imported catalogues in some way - or throw them away - in order to keep from being confused in the future. If you find that some photos are in more than one catalogue, choose the catalogue with the most current version as best you can. This is outlined in the movie in Figure 8. You will need to open each catalogue in order to compare how different the file settings are for duplicate images. If your catalogues are all a total mess, then you can simply make the new Master Catalog and import all your images into it, and throw away the old catalogues. FIGURE 6This movie shows you how to rename a catalog as your new Master Catalog and move to the Working folder. FIGURE 7This movie shows you how to import files from other catalogs into the new Master Catalog. FIGURE 8This movie outlines some options for dealing with duplication as you merge catalogs into your new Master Catalog. As this lesson outlines, the work you do in Lightroom lives primarily in the Lightroom catalogue. As long as you view and work with your raw images in Lightroom, it is fine to leave things like that. But sometimes you may want to save the settings back to the file so that the metadata is more permanently attached to the file. If your original files are JPEGs, TIFFs, or PSD files, then saving metadata back to the files will update the embedded metadata in the file. Your changes to copyright, keywords, location tags, etc can all be saved into these files. Note that the image adjustments will not be applied to the these file types, although the Develop settings can be saved into the file. If you edit proprietary raw files (such as NEF or CR2) in Lightroom, you cannot save the metadata back to the files themselves. Lightroom will create an XMP sidecar file with all the metadata and Develop settings included. You will have to keep the sidecar file in the same folder as the raw file to keep the information together. The DNG file format has been designed to allow metadata, develop settings and more to be embedded in a file that supports raw image data. By converting your proprietary raw files to DNG, you can keep all the rawness of the file, but you can embed any important metadata into the file itself, rather than a sidecar file.